Contributors: Francesca Marzatico, Roukaya Kasenally, Eva Palmans, R D Russon, Emmanuel O Ojo, David U Enweremadu, Christopher Isike, Sakiemi Idoniboye-Obu, Dhikru AdewaleYagboyaju, J Shola Omotola. Key terms: Southern Sudan, Referendum, Self-determination, Legal Challenges, Mauritius, Democracy, Elections, 2010, Burundi, Democratie, Paix, Democratic, Local Government, South Africa, Democratisation, Nigeria, Public Perceptions, Judicial Decisions, Election Disputes, 2007, General, Judiciary, 2003, 2007, Democratic Consolidation, Fourth Republic, Corruption, Electoral Reform, Consolidation. ABSTRACT: This study attempts to analyse the major challenges encountered in the organisation of the Southern Sudan Referendum on Self-Determination and how these challenges were addressed, enabling the referendum to take place in a peaceful environment, with a high degree of transparency and fairness. In doing so it aims to identify a few lessons which, though emerging from the particular experience of the Sudan, can be used as a general paradigm in future similar contexts. The Southern Sudan Referendum Commission had less than four months to prepare, organise and conduct the operations within a broad mandate conferred by the Southern Sudan Referendum Act, many sections of which lacked clarity. The interpretation and application of this law represented, in several instances, a serious challenge to the organisation of the referendum, adding complexity to a process already made difficult by time and operational constraints amplified by the size of the territory and the highly sensitive political environment characterised by mistrust among the partners in the Comprehensive Peace Agreement. The study begins with a brief introduction to the political and legal background of the referendum and of the Southern Sudan Referendum Commission, including its role and structure. It proceeds with an analysis of the legal and regulatory framework, aimed at identifying the main challenges to the process and the solutions found in order to allow the referendum to take place in a timely, peaceful and orderly manner. ABSTRACT: Mauritius has come a long way since independence in 1968, when observers predicted that the 'overcrowded barracoon', as V S Naipaul referred to the island, would fail to achieve peace and economic prosperity. As a result of its success in managing diversity and capitalising on protected markets and guaranteed export prices Mauritius has emerged in recent decades as a democratic and economic model for its peers on the African continent. However, with the onset of globalisation Mauritius is now entering a period of democratic stagnation as islanders confront the rise of ethnic and dynastic politics, the advent of political cronyism and patronage, the marginalisation of minorities, and growing disenchantment with and cynicism about the political class. This article highlights what can be considered the numerous deficiencies and flaws in the highly celebrated Mauritian �picture perfect model'. Due attention must be given to addressing these if a social, economic and political implosion is to be avoided. Les Elections de 2010 au Burundi: Quel Avenir Pour la Democratie et la Paix? ABSTRACT: Political pluralism and well-functioning political parties are crucial to sustaining democracy. In a democracy elections allow for open political competition in order to win votes. Thus elections are a necessary but not sufficient condition to consolidate democracy. The 2010 elections in Burundi showed that elections, although crucial to the estbalishment of democracy and peace, are not a guarantee in themselves that this goal will be attained. Rather than being a step towards more democracy and peace Burundi's last elections gave an overwhelming majority to one party, the CNDD-FDD, and marginalised the opposition because of its decision to boycott the process as a way of protesting against the results. With one party dominating all institutions and with an authoritarian response to opposition parties who, in the absence of dialogue, are increasingly considering the option of using guns to voice their concerns, democracy and peace are at risk. This article analyses the causes and consequences of Burundi's 2010 elections in terms of political environment and behaviour and against the background of the country's recent electoral history. Ten years of Democratic Local Government Elections in South Africa: Is the Tide Turning? ABSTRACT: Since the 2006 local elections the ruling African National Congress (ANC) has lost a total of 48 wards in by-elections and won only 15. This is a complete reversal of the party's performance between 2000 and 2006 when it lost only five wards and won 47. Does this signify a change in South African voting patterns? 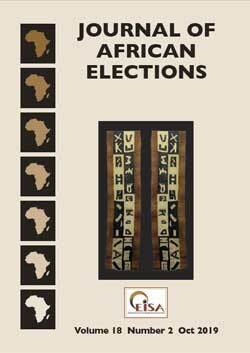 This chapter is based on an in-depth analysis of election data provided by the Electoral Commission of South Africa on its website. The analysis covers a ten-year period from 2000 to 2010 and includes results of the 2011 local elections. It also refers to the national elections of 1994 and 1999 to make a comparison. The analysis shows the dominance of the ANC since the first democratic elections in South Africa in 1994, which it won, and continued to increase its voter support, peaking in 2004 with a 69.69% majority. Similarly, in local elections the ANC dominated in 2000 and 2006. The 2011 local elections show a slightly different picture. By-elections are also discussed, with data demonstrating a similar trend to that in the national and local elections. The period from 1994 to 2006 was a period of growth for the ANC and the period 2007 to 2010 was a period of decline, thus demonstrating a Bell Curve pattern. ABSTRACT: In a plural and deeply divided society like that in Nigeria post-election disputes are a recurring problem and if care is not taken in their resolution may exacerbate the problems of national integration. Elections do not only perform the function of elite recruitment into public office but are a mechanism for national integration. In a heterogeneous society like that in Nigeria if post-election conflict is not handled with the required neutrality the election suffers enormously from a credibility crisis. It is against this background that this article examines the role of the judiciary and its impartiality in resolving election-related conflicts arising out of Nigeria's 2007 general elections. It infers that, in a number of cases, the public perceived judicial officers to have compromised themselves. No doubt this compounded the problem of integrating Nigeria's disparate ethnic groups and, at the same time, whittled down the confidence of members of the public in the capacity of the judiciary to be an impartial arbiter. The article recommends training and retraining for judges in the interests of both national integration and democratic sustenance. ABSTRACT: For many Nigerians, and indeed in the eyes of most foreign observers of Nigerian affairs, the restoration of democratic rule in Africa's largest country in May 1999 has brought little or no change in the politics of this vast nation of 150-million people. Corruption, electoral malpractice and political violence, the usual causes of governmental instability, have remained intractable despite a deluge of reform initiatives. Yet, as this article will show, while the benefits of most institutional reforms have been difficult to measure, there has been significant progress in a few other key areas of national political life. One of them is the relatively successful reform of the judiciary, which has led to the institution's gradual emergence as a courageous and impartial arbiter in intra-elite electoral disputes in this chronically unstable federation. The transformation of the judiciary is amply demonstrated by the large number of judicial pronouncements that have upturned the results of several flawed elections and restored to office elected officials, such as state governors, wrongfully removed from their positions. This article argues that these decisions and the new activist role of the judiciary which produced them have, in many ways, helped to reinforce the role of the judiciary as a vital instrument of political control and democratic stabilisation and by so doing have helped to prolong the life of Nigeria's Fourth Republic. ABSTRACT: The date 29 May 1999 marked the advent of another period of democratic governance in Nigeria. Before that the country's post-independence history had been mired in instability and characterised by political violence, frequent military coups and a profound crisis of legitimacy. The military, which had given the people some hope in the face of the patron-client politics of the first and second democratic republics, dashed expectations as military rule became synonymous with corruption, economic mismanagement and gross human rights abuses such that Nigerians began to yearn for a return to democracy. This was the mood when the �fourth wave' of democracy flowed across the political landscape in 1999. The article examines how democracy fared in Nigeria between 1999 and 2009, especially under former president Olusegun Obasanjo, who, in 1999, became Nigeria's third democratically elected president. It examines specifically Obasanjo's self-perpetuation bid and its impact on democratic consolidation in the country and concludes that Nigeria's democratisation process is still trapped in its transitional stages. ABSTRACT: The hope of a new Nigeria characterised by good governance and rapid socioeconomic development, which accompanied Nigeria's democratisation in 1999, seems to have largely been squandered 12 years into the process. In view of the effects of dashed hopes on the psyche of most ordinary Nigerians, as well as their impact on the overall development of the country - the pivot around which the African continent should revolve - this article attempts a critical examination of some probable causal factors. Among the various possible factors the paper identifies political corruption as the most prominent and debilitating. It discusses the effects of political corruption on the character of the state in Nigeria as well as the corruptive impact of the system of party funding in the country. Similarly, it analyses the effects of the country's phenomenal earnings from the sale of crude oil, which are not properly accounted for, and the uncontrolled culture of impunity among many holders of sensitive public office. It concludes that there is a need to re-invent state functionality, particularly through purposely engaging professionals and civil society groups in governance and public affairs in general. ABSTRACT: The article analyses the ongoing electoral reform process in Nigeria and the prospects for the consolidation of democracy. Specifically, it explores the justifications for reform, evaluates the mechanisms adopted to promote electoral reform, notably the inauguration of the Electoral Reform Committee, its report, government's white paper on the report and the implementation of approved reform measures. Generally, the reforms have been targeted at instituting a strong election management body with substantial administrative and financial autonomy and at promoting a democratic political culture within parties and the populace. Drawing concrete insights from the 2011 Nigerian elections, which provided the first litmus test of the possible impact of the reform on the democratisation process, the article argues that while the reform process holds some promise of consolidation, it does not go far enough. Though institutional designs matter for effective electoral governance institutional reengineering without corresponding attitudinal and behavioural reform is not sufficient. The strategic decisions of the political actors, both senior and junior, to take advantage of the institutional reform process within legally permissible limits hold an important key to the restoration of credibility and public trust in the electoral process and its outcome.